If you do any kind of networking, or if you’re in business in general, chances are you have a business card. But what kinds of things should be on your cards? People remember faces! They won’t always remember your name, at least not at first. But they’ll remember your face! It’s also a nice talking point. I get a lot of comments on my business card because my headshot is on there. (Of course, this has nothing to do with my actual face, just the fact that my face is on there!) I got my professional headshot done by Fred with Fredshots. I do recommend getting a professional headshot done, and put it on your business card! Something else to think about. Customers want to know who’s coming in their home. This helps them remember you and your company. Make sure that your logo is prominent on your card. The more people see your logo and your face, the more it builds your brand recognition. I know you can’t run to your bank account to see how that kind of recognition has impacted your cash flow, but trust me it’s important! So for a professional look to your cards, make sure your logo is there. If you don’t have a professional logo made up yet, contact me, I have some good resources for that. This may sound elementary, but make sure your website URL is on your business card. Some people just don’t think about this, and then the customer is left wondering how to find you online. Sometimes it’s easy for them to find you because your URL aligns with your business name. But sometimes it does not, and then your potential customers really need to see that URL! Of course, you want to put your phone number on your business cards. I have my cell phone number on my cards. Since it’s a cell phone number people can text to it or call me on it. In fact, I’m going to update my card to let people know that they can text me if they prefer. Some people would really rather text than call. If you have different phone numbers for different lines, such as an office line, a cell phone, a fax number—list all of them. You want to make it as easy as possible for people to contact us when they need us! Your contact information includes your email address! We do live in a world where we want to do everything with our phones—except make phone calls! So give them the chance to email you if they don’t want to pick up the phone and call you. Down at the bottom of my card I have social media icons for Twitter, Facebook, LinkedIn, and Pinterest. If you’re active on social media—and obviously, I recommend that you are—add in the icons for the platforms on which you are active. This lets people know that they can find you and follow your Facebook page or your Twitter account, etc. Have you ever noticed that often when you hand someone your business card, they turn it over and look at the back? So if you can have something there for them to see, and it’s not just blank, that’s definitely beneficial. So these are some tips to help you with your branding, give you a great image whenever you are out there in the networking world, and hopefully drive more traffic to your website and to your social media profiles. If you have some tips I’d love to hear about them in the comments! 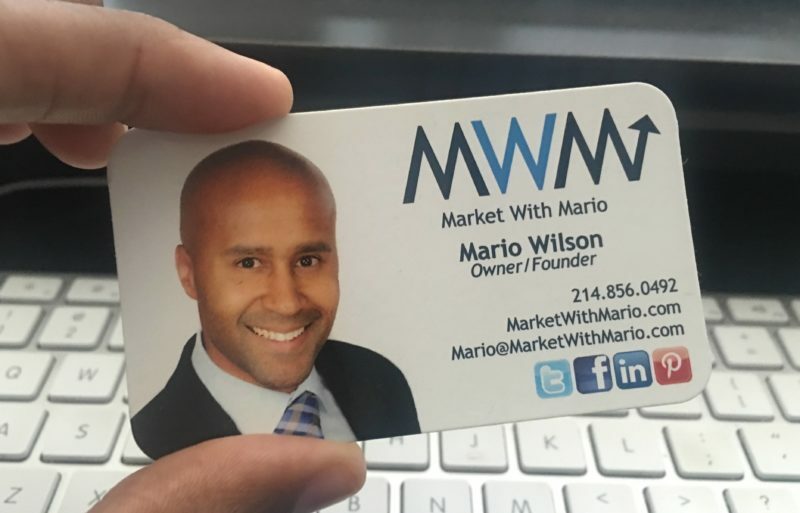 Also, if you do not have someone who you trust to make you some great business cards, I recommend Laurie Roberts with Proforma, and also Tunya Green of Minuteman Press in Allen. If you need their information, let me know and I’ll hook you up!